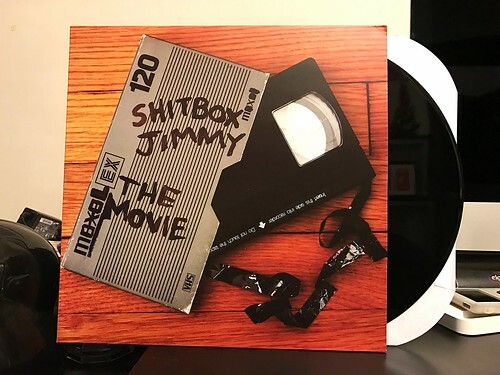 When I was sent this Shitbox Jimmy record to review, I thought it was a bit funny that the name of their album is The Movie. because the band name immediately makes me think of my very favorite movie. Not that I hear the word shitbox all that often, but when I do it's impossible to not be reminded of The Blues Brothers and the Bluesmobile being referred to as "That shitbox Dodge." So right away this band was putting me in a mindset to want to like them. I also dug the artwork with the unspooled VHS tape. Again, tugging on my nostalgic 80's feelings. Unfortunately, while it's not bad or anything, Shitbox Jimmy's music doesn't really maintain those good vibes as I go through the album. I think the thing that is the most off putting to me is the vocals. They're really buried in the mix, unnecessarily full of static and nearly impossible to understand. They've kind of got a howling in a cave feel to them, but not in an energetic exciting way like say, The Blind Shake. The way these are recorded kind of make me think they're trying to hide the vocals. I say this as someone who has gone out of their way to hide vocals on things I've recorded with friends. On the other hand, the music itself is alright. They've got a nice jangly guitar sound that reminds me a bit of the tone Royal Headache is able to achieve. The songs themselves are catchy enough with a bouncy 60's throwback rock and roll vibe to them. I'd probably like this a lot more if the vocals were better, but alas, it just wasn't meant to be. If you face any issue with your HP printer technical support, we are here to provide you the best support services. You just need to call us on our HP printer technical support customer care number +1-844-802-7535. Much obliged to you for such an awesome blog entry. This post has helped me a great deal in settling my issues with the printer effectively. I likewise found that Sapphiresoftech.com is additionally useful in giving significant data with respect to any printer issue.